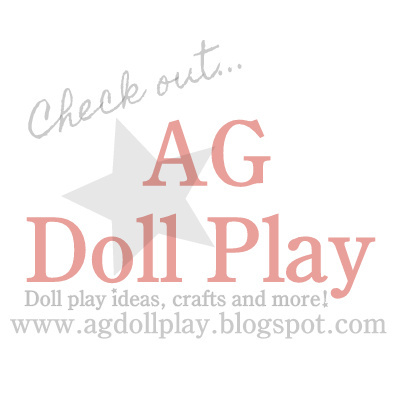 American Girl Doll Play: A Surprise Welcome! When I decided that Gracie should get the new Bitty Baby, and Lily took the new outfit...somehow it still didn't seem very fair. SO the day after Baby Daisy arrived, I decided to surprise Lily with a new American Girl doll that I had picked out at the Madison Children's Museum Benefit Sale earlier this summer. (You might remember that I bought more dolls than I had reasons to, so I am trying to spread out when I give them out. At just $30-40 per doll, I couldn't pass up getting extras! And, it is really fun to hand them out as a surprise like this!) Lily had no idea that she was going to be getting a new doll, so the look of excitement and joy on her face was priceless! As soon as she saw her, she announced I am naming her Chrysanthemum! I am naming her after a flower, just like me! I loved it! She can call her Chrysa, Chrysie, Chrysanne or Chrys! She is number 49, shiny black hair, blue eyes and medium skin. The color of her skin is like a summer tan, and we decided her family may be from Italy or Spain, but she is definitely and American Girl! "She is into roller blading," was the second declaration Lily made about Chrysanthemum! She might be the most beautiful doll I have seen! I was loving our Indian doll Salena because of her unique look and straight black hair, but I think I have a new favorite! I absolutely LOVE her shiny and extremely smooth waves! Her blue eyes sparkle and really catch the light. I had so much fun photographing her, that I took a ton! Wow, is that a good representation of the color of her skin? She looks pretty light-skinned to me, not medium at all. My dd got a My AG this year with "light" skin, dark brown (black) hair and brown eyes, and the skintone on hers looks almost Hispanic. We were a bit disappointed, since my dd is quite fair-skinned, and we were going for a look-alike doll. I was expecting something about the skintone of Kit, the only other AG I've seen in real life. Other than that, we really love her, but she is most definitely NOT what I would consider light-skinned. I didn't do any photo editing on these photos, just set her in a sunny window. She really looks like she has a summer tan and is quite darker than Kit. I think if she had brown eyes, she would look Hispanic, but because of those blue eyes, and because I bought her at the peak of summer, I see her as tanned. Her cloth body is that slight orange/tan, not the light flesh tone of our other light skinned dolls. She is gorgeous! Congratulations on the new addition to the doll family.